Put the phones down and get ready for some good old fashioned fun. Put the phones down and get ready for some good old fashioned fun. 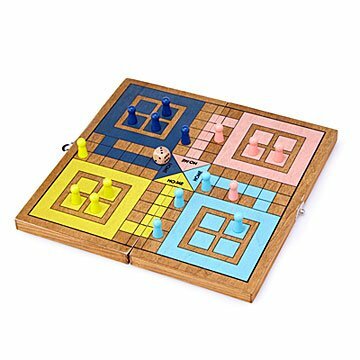 Crafted from wood, this classic board game (like 16th century India classic) keeps it simple and stylishly nostalgic: be the first to move all four of your pieces around the board and into the "winners circle." It's foldable, so the pieces stow inside for easy clean-up and toting, whether it's to a weekend at the lake or game night down the street. Made in China.